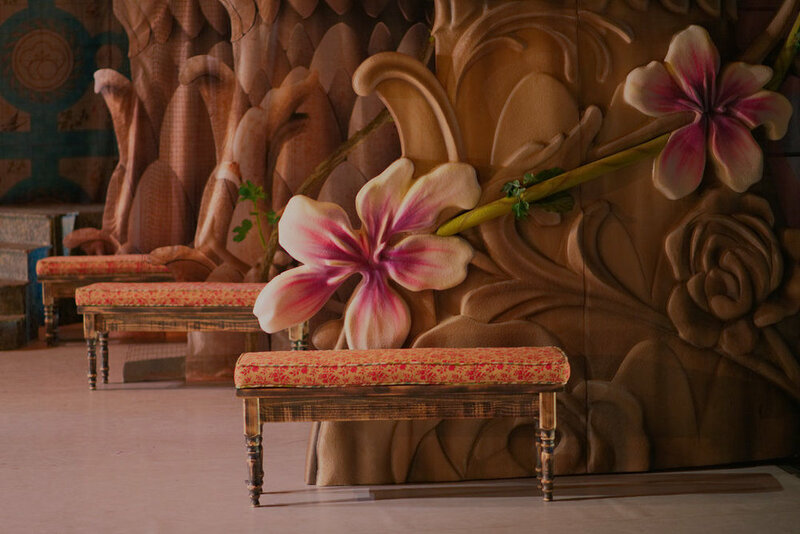 Last year I had the incredible opportunity to work with the Alberta Ballet as set designer for The Sleeping Beauty. During our first meeting the Associate Artistic Director Christopher Anderson described his vision for the ballet and what stood out to me the most was that he wanted the visuals for this performance to have a contemporary aesthetic inspired by Alberta's outdoors that would speak to today’s audience. The challenge was to make something that wouldn't take attention away from the dancers but rather support their performance, the costume design and the story. This project consumed the majority of 2018 and by the end I had logged over 600 hours putting together these enormous mixed media environments. The backdrops measured 60ft x 30ft. Each of the three scenes consisted of 4 to 6 layers of artwork on either side stretching from the front to the back of the stage. Most of the artwork was printed and hung while selected elements such as the pillars in the foreground of act 3 were carved out of foam then painted.